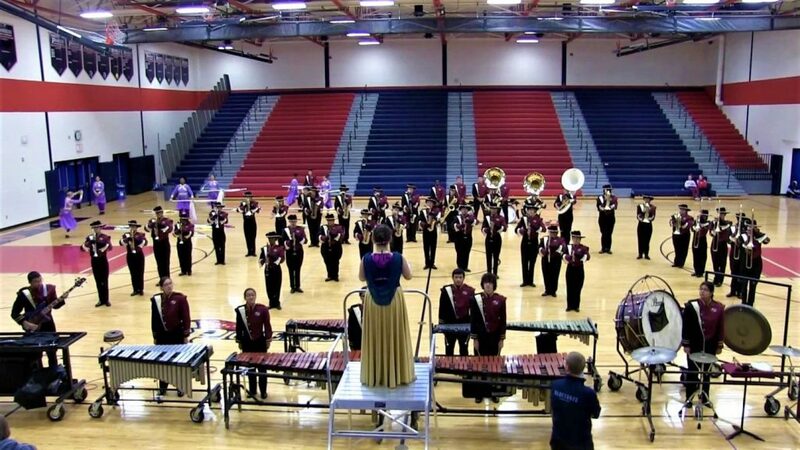 Stonewall Jackson Marching Band performs indoor gymnasium rendition of it 2018 Show “Arabian Nights” in static-stationary fashion due to overnight rain extending throughout the morning October 27 during the 2018 Virginia Band and Orchestra Director’s Association (VBODA) Marching Assessment at Patriot High School in Nokesville. Finishing the ratings and competitive season with a high caliber performance despite overnight rain extending throughout the morning which constrained Stonewall Jackson Marching Band and six other participating Class A and Class AA bands to indoor gymnasium performances; judges assessed the Marching Raider’s with a rating of Excellent for rendition of its 2018 show “Arabian Nights” in static-and-stationary fashion Saturday (October 27) during the 2018 Virginia Band and Orchestra Director’s Association (VBODA) Marching Assessment at Patriot High School in Nokesville. 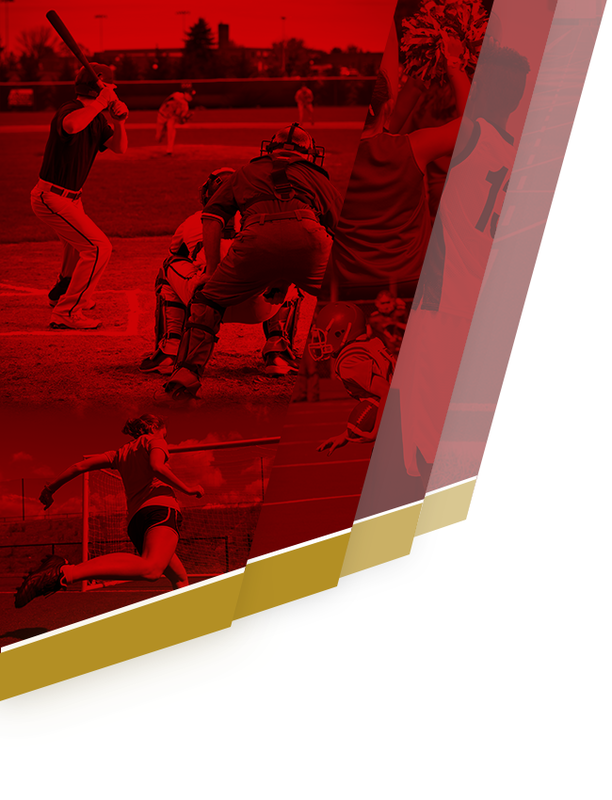 The Excellent rating is the second highest rating from the higher rating of Superior and the descending lower ratings range from Good to Fair and Fair to Poor. “I want you to go home and enjoy the fact that you put on a Superior Performance,” said Vince Bryk, SJHS Band Director despite the assessed Excellent rating. 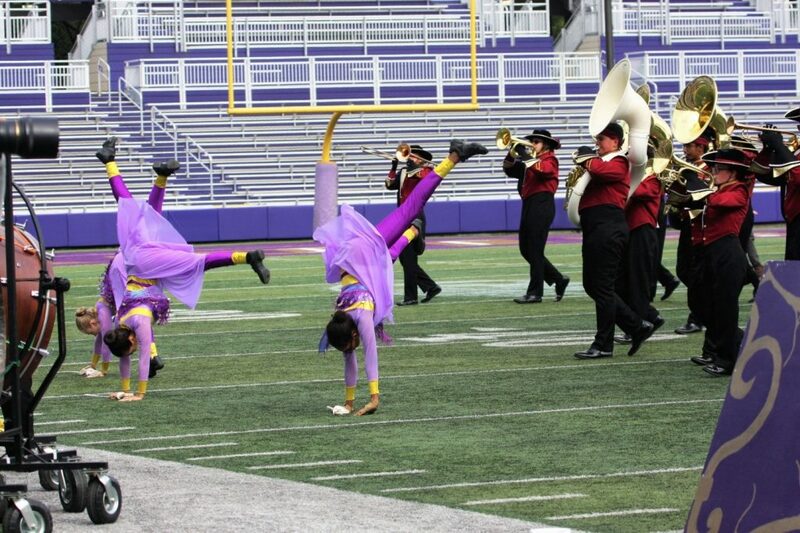 SJHS Color Guard demonstrate gymnast-like choreography as part of the Marching Raider’s competitive performance at James Madison University Parade of Champion Bands Competition. Parade of Champions in Bridgeforth Stadium during the prior weekend showcasing weeks of revamping, tweaking, and the making of fine adjustments culminating in a fine-tuned, well-oiled marching and performance machine under the guidance of Band Director Bryk, and Color Guard Instructor Devon Robinson with assistance from Percussion Instructor Ricky Nunez and Pit Instructor Michael Agre. 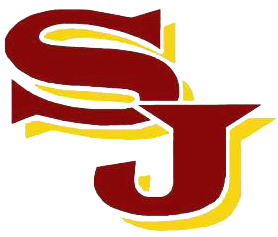 Next, encore performances may be the order of the day as the SJHS Marching Band will be available to provided support to the Stonewall Jackson Football Team as they participate in the play-offs with the potential for advancing. Otherwise, the final event of the Marching Band Season will be the 73rd Annual Greater Manassas Christmas Parade, December 1, 2018. From left to right: Seniors: Leslie Montiel, Nirian Lucas, Cassana Bohman, Ashley Agre, Ksanet Mehari, Ericson, Bass, Kayla Blankenship, Abigail Cantoni, Zachary Cantoni, Johnathan Carcamo, Elderick Kamara, Alexander Kelly, Noah Liles, Catherine Lopez, Tamanna Sheikh, Ian Smith, Isaac Thompson, and Danny Torres. Not pictured is Joseph Green.